Global Sandblasting Machines Market size was estimated over USD 375 million in 2017 and will exhibit growth of over 5% up to 2025. Revolution in the automation industry is said to drive the sandblasting machines market demand largely. Growing demand for robotic blasting procedure in marine, automotive building & construction industries, where complex process requirements, precision and accuracy are most critical factors, is steadily surpassing traditional blasting solution due to increasing applications including surface preparation, coating removal of historic monuments, boat hulls, tanks, truss towers, bridges etc. With a robotic blast system, the need for extra manpower to operate the machine is reduced that eventually reduces the operational costs and waste generation. These factors will boost the global sandblasting machines market demand in coming years. Increasing popularity of sandblasting machines in construction and restoration activities to roughen, smooth, or clean surfaces to improve the shelf life of architectural monuments and surface texturing of aesthetic concrete to enhance its durability is primarily driving the industry demand. In addition to this, the flourishing residential construction sector will likely accelerate demand for sandblasting machine equipment. Robust growth of construction industry owing to rapid industrialization in developing countries such as China, India Japan will spur the demand for sandblasting machines during the forecast spell. The industry can elicit potential environmental concerns due to factors such as noise pollution and process wastewater discharges from dust control sprays. Inhalation of dust from silica sand and other abrasive materials might pose potential health hazards as it increases the risk of contraction of several lungs diseases like silicosis. Governments of many countries had prohibited the use of cleaning abrasives that contains more than 0.1% silica, and several counterparts approved by government bodies like EPA, USDA, and FDA are also being adopted by manufacturers such as eco-friendly dry ice blasting to avoid environmental effect. Abrasive blasting is also used to eliminate the composites of lead paint on the steel structure of bridges, that might pose a risk to the nervous system of the operator. In wet sandblasting, an abrasive material is mixed with the water jet to create an abrasive spray Wet sandblasting is considered as an alternative to dry blasting that includes blast cabinets, blasting booths, production machinery and portable blasting units. Its advantages include reduced dust and the elimination of static cling will form a clean surface. It has wide acceptance in the field of paint removal and widely used in heavy engineering, fabrication, and construction. 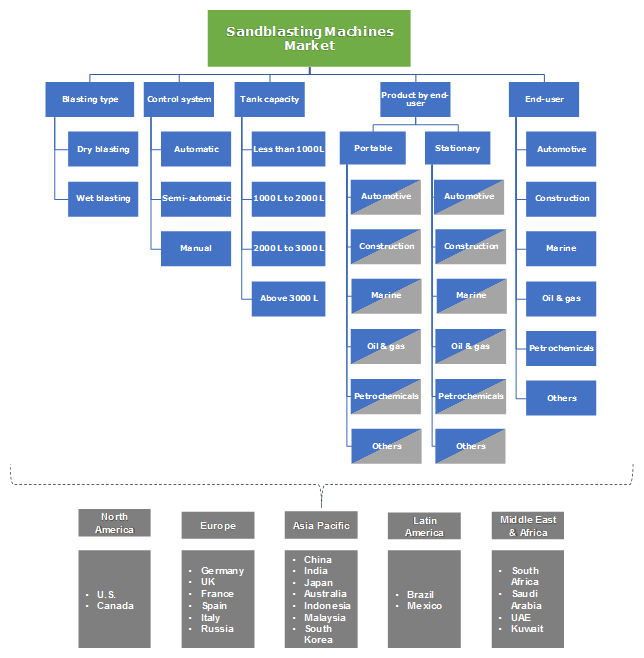 Based on control system, the global sandblasting machines market has been segmented into three major categories, namely, automatic, semi-automatic, and manual. The U.S. automatic blasting segment is said to witness growth at a moderate pace and accounted for around 45 % share in the in the overall industry. The APAC manual blasting segment held a maximum industry share of close to 40% in 2017 and will grow at the highest CAGR over the coming 7 years, due to availability of inexpensive labor and absence of regulatory norms. The semi-automatic blasting segment accounted for over USD 50 million in 2017 and will grow with a CAGR of over 5% in the forecast spell. The global sandblasting machines market has been segmented on the basis of tank capacity available in less than 1,000 Liters (L), 1,000 L to 2,000 L, 2,000 L to 3,000 L and above 3,000 L. The less than 1,000 L segment will capture the highest market share of around 70% by the end of 2017. Mini sand blasting machines are inherently portable and can be deployed for household tasks such as rust removal, cleaning mill scale, repairing and paint removal. Increasing substitution of manual labor for performing domestic tasks is expected to boost the growth from 2018 to 2025. The sandblasting machines market is segmented on the basis of blasting type as portable and stationary. Based on revenue, stationary segment held approximately USD 220 million of the of the overall sandblasting machine market share. Stationary segment consists of large number of bulk blasters used especially in the oil & gas and petrochemicals industry. Portable or movable machines consists of hand-held as well as wheel mounted mechanisms. These products find extensive applications in the automotive sector as well as for construction purposes. The portable segment accounted for around USD 175 million in 2017 and will grow with a CAGR of over 5%. 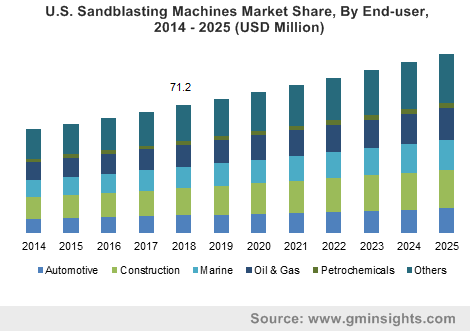 The global sandblasting machines market has been segmented on the basis of end-user as automotive, construction, marine, oil & gas, petrochemicals and others. The others segment includes, painting, metalworking, etc. In 2017, construction segment is said to hold the maximum share of around 30% in the global sandblasting machines industry. The usage of portable sandblasting machines in automotive and metalworking industry for electroplating pre-treatment, finishing and polishing will further foster the portable sandblasting machines market demand, thereby boosting the overall industry. Asia Pacific holds a major share of over 40% in the global industry owing to huge industrial, construction and manufacturing activities in this region. In 2017, China market size was around USD 70 million and is said to exhibit growth with over 5% CAGR in the forecast timespan. China stationary sandblasting machines market held approximately 55% of the country’s overall industry share and is set to grow with a decent CAGR in the forecast period. North America held a market share of over USD 80 million in the global industry. The wet blasting segment in Germany accounted closely for around 85% of the overall industry share in 2017 and is said to grow with a CAGR of close to 4.5% in the forecast timeframe. UK industrial sandblasting machines market was valued over USD 6 million in 2017 and will grow with a bare CAGR in the coming 7 years. Prominent players present in the global sandblasting machines market include Airblast B.V., MHG Strahlanlagen, ABShot Tecnics, Paul Auer, Clemco Industries, Empire Abrasive Equipment Company, Burwell Technologies, Graco Inc., Kramer Industries, Gläsner Sandstrahl Maschinenbau, Abrasive Blasting Service and Supplies, Sintokogio, Axxiom Manufacturing, Torbo Engineering Keizers, and Manus Abrasive Systems to name a few. Recently, in 2017, Graco Inc. acquisition of Smith Manufacturing, a well-known brand for surface preparation and grinding equipment used in striping, road construction, road maintenance and concrete flooring/surfaces had significantly expanded the company’s product portfolio as a part of growth strategy. Global Industry is said to grow at a strong pace owing to its increasing usage in end-user industries such as automotive, construction, marine, oil & gas, petrochemicals and others. The product finds application in these fields specially where precise and smooth surface finishing, shaping and cleaning is required without hampering the actual design of the surface being sandblasted. Lucratively increasing product demand in the construction and petrochemical sector owing to increasing robotics and automation applications will further propel the industry demand in the coming days.